Ever wonder why Western Red Cedar cladding has become one of the most popular choices for external and internal cladding in the last few decades? The truth is that cedar cladding has a long history, and this beautiful wood has been used for many centuries by the aboriginal people of British Columbia's Pacific Coast in Canada. The native people of BC relied so much on cedar that they named it the "Tree of Life." Not only was this tree invested with spiritual significance, it was also one of the most versatile building materials that they had access to, and the different First Nations groups throughout BC discovered many creative ways to use this tree to their advantage. The wood from the cedar tree has been used in native societies for thousands of years for as many different uses as possible, including cedar bark rope, baskets, and clothing. Long houses, the traditional centre of native society, were constructed with massive cedar logs and large slabs of bark were used for cedar cladding. Cedar logs were also carved into ceremonial totem poles and masks with faces evoking the likeness of animals and spirits. Some groups of First Nations people, such as the Kwakiutl, would even make their canoes out of cedar bark. The long lasting properties of cedar are proven in the fact that many Native buildings and artefacts constructed out of cedar over a century ago are still intact today. The First Nations people of British Columbia seemed to know from experience what we know now about cedar, that it is one of the most stable, easy to use, and long lasting materials available to build with. 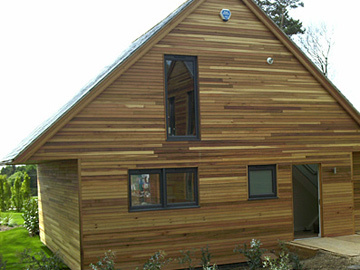 Cedar is a low density wood, and has very little shrinkage, which makes it easy to use for cedar cladding. A house with cedar cladding used for the roof will be energy efficient, as cedar offers exceptional thermal insulation value. This lightweight wood is easy to work with, making cutting, forming and gluing a breeze. It has a fine grain and not as much resin as other woods, which allows it to hold glue bonds with ease and accept all varieties of paints and stains. Western Red Cedar actually contains naturally occurring preservatives which ensure that it resists insects, moisture, and decay, making it one of the most durable types of wood in the world. We can learn a lot from the wisdom of First Nations cultures in Canada, and one of those lessons is that cedar is one of the best building materials available to us and this gorgeous richly coloured wood should be respected as the important resource it is.